Two For One – Holiday Drinks by Daisy! Welcome back! Its Sabroso Saturday again! (Translation: Tasty Saturday) and today I brink you two drinks for one! Below are two recipes that I know you will love. I give you both hot and cold drinks! These recipes are by the talented Chef, Daisy Martinez. Click here to see my exclusive interview with her! Combine all ingredients in a blender and blend at low speed until smooth. Pour into a pitcher and serve in small glasses. NOTE: If you are concerned with eating raw eggs, you can use egg substitute with wonderful results. Also, wash the shells well before using them may reduce any risk of infection. In any case, pregnant women and those with compromised immune system should avoid raw eggs. 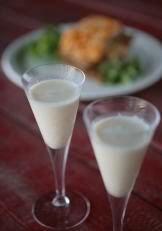 *I make coquito without the rum since the kids love it so much! Which drink was your favorite? This post is part of Ms. Latina’s Sabroso Saturday link-up. Check it out and find some more great recipes! « TOY STORY 3 DVD GIVEAWAY WINNER!